For the last three years, students have been putting pressure on the provincial government to provide remuneration for internships. They want to see interns considered workers under the labour code, so they can get the same rights and protections as regular employees. Still, students are unsatisfied with the responses they’ve received over the issue. “It’s evident that [the provincial government’s] short term solutions won’t solve this issue in our society,” said Raphaëlle Théorêta—a psychoeducation student at Université de Montréal—in front of the ministry’s office. Sandrine Belley, a social work student the Université du Québec à Montréal, said she’s concerned and that Roberge has “made it clear” that provincial budget won’t include anything regarding remuneration for interns. Charlène Boucher, member of Campagne sur le travail étudiant UQAM, said in a statement that if the minister doesn’t get to work, then interns and students will do the same. “No salary, no trainees,” Bousher wrote in the statement. “It’s not just the money, we don’t have the right of workers during our internships,” Dupuis said. 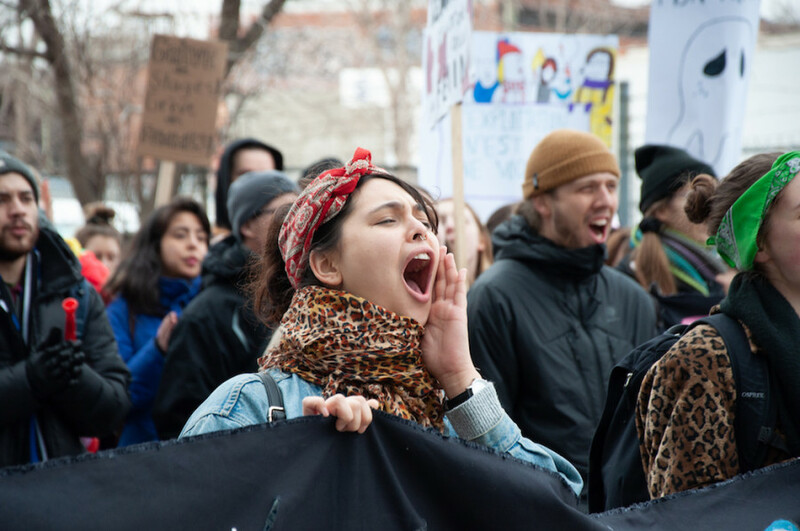 Various student associations across Quebec—including Concordia’s School of Community and Public Affairs—will be holding general assemblies on Friday. Belley is expecting students to continue voting in favour of continuing the general unlimited strike. “The strike will continue as long as we get what we demand,” Dupuis said.